BOGOTA, NJ, USA, October 26, 2018 /EINPresswire.com/ -- Bogota, NJ — October 26, 2018 – As elected officials and community leaders gathered along a bend in the Hackensack River shoreline in Bogota, New Jersey on October 25, they marked the official groundbreaking for a project years in the making – one that signals continued revitalization on the Hackensack River waterfront in Bogota. The River Club is set on more than 13 acres on the eastern bank of the Hackensack River opposite the city of Hackensack, located in the Borough of Bogota, in Bergen County, NJ. The development will include 421-luxury rental homes, including 42 affordable units, a public riverfront walkway and dog park. The 8,000 square foot state-of-the-art clubhouse will include exercise rooms featuring internet-connected spin cycles, on-demand fitness classes, a yoga room, a media center and co-working spaces/conference rooms with wi-fi throughout. 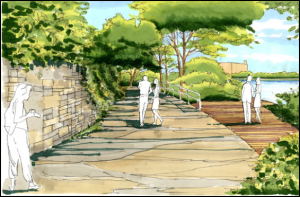 An additional 5,000 square foot outdoor amenity area will have an infinity edge outdoor heated pool, built-in natural-gas grills, fire pits, and an outdoor theater. The plans for the property include an on-site NJ Transit bus stop with access to NYC. For those preferring train service, the property is located less than a mile from two NJ Transit Rail stations. For those commuting by car, Route 80 and Route 4 are both just minutes away from the site. Bogota Mayor Christopher M. Kelemen commented, “This is a win for the Borough of Bogota, transforming a shuttered industrial and commercial site into a development that will be an asset to our community, continuing revitalization along the waterfront, supporting our tax base, and providing new housing options in the Borough, including affordable housing.” Bogota Councilman Thomas Napolitano, a long-time advocate for the redevelopment project added, "The River Club will be a spectacular addition to our community and another reason we call The Borough of Bogota the Jewel of Bergen County." Bergen County has continued to emerge as a compelling choice for young professionals looking to move away from the highly priced Manhattan, Brooklyn and NJ Gold Coast markets, while maintaining mass transit access to New York City. The area offers unparalleled shopping, parks and recreational amenities and a deep employment base. 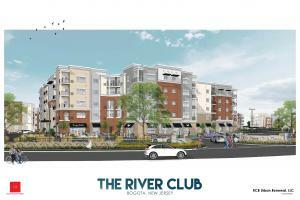 The River Club is located just 2.5 miles from Route 4 which offers world-class shopping at The Shops at Riverside in Hackensack and Garden State Plaza. Nearby employers include The Hackensack University Medical Center (at 9,000 employees – the largest employer in Bergen County) just a half mile from the site, Valley Health Systems, Express Scripts, Bio-Reference, and the seat of the offices of Bergen County. Downtown Hackensack, just across the Court Street (Dillard Memorial) Bridge from The River Club, continues its own resurgence, adding to the area’s allure. Site work at the River Club is nearly complete. The developer anticipates that foundation work for the first two buildings will start in November, with the first units ready for occupancy by the end of 2019. Jonathan Stein, the principal of PCD Capital, LLC, is a real estate developer with a thirty-year track record of developing apartment communities, for-sale housing and mixed-use master-planned communities throughout the northeast. PCD Capital develops property through its development wing, Diversified Realty Advisors, LLC. PCD has a pipeline of approximately 6,000 residential units and 700,000 square feet of retail and commercial space, including several master-planned, mixed-use communities. Jon’s flagship endeavor is the redevelopment of the former GM automobile assembly plant in Sleepy Hollow, NY. This master-planned, mixed-use, transit-oriented, waterfront development on the banks of the Hudson River in Westchester County is being developed with 1,177 residential units, 135,000 square feet of retail space, 35,000 square feet of office and a 140-key hotel. Martin Berger and Michael Klinger, the principals of Saber, have completed over $1.4 billion dollars’ worth of developments to date along the eastern seaboard of the US. Its principals have conceived, negotiated and implemented development plans, financed, built, leased and placed into service each of its developments from ground-up. Notable communities currently under development include The Collection, a mixed-use site in downtown White Plains, NY planned for 276 luxury multifamily rental homes with 25,000 sq. ft. retail across from the Westchester Mall and the recently completed Rivertowns Square in Dobbs Ferry, Westchester County, NY that includes 110,000 sq. ft. retail space, a 107-room hotel and 200 luxury rental apartments. For more information on Saber, go to www.saberfund.com.